On our Open Challenges you can raise money for any charity of your choice, or pay your own way. This is one of our most popular treks, especially to those new to multi-day trekking. Depending on our flight arrival time, we will either avoid Beijing’s considerable traffic and transfer to the start of our trek at the small town of Huangyaguan, where we can freshen up and relax! Alternatively, when our arrival time makes it practical, we will transfer into Beijing. Here we enjoy a tour of Tianenman Square and the Forbidden City, the must-see sight of Beijing, before a night in the city. There will be a full trip briefing in the evening. Night city hotel / mountain hotel. NB: If transferring straight to Huangyaguan, there will be opportunity to visit the Forbidden City at the end of the trip. Huangyaguan is a small town situated in a beautiful valley in the heart of the Yanshan Mountains. After a fairly leisurely start (or driving from Beijing), we have our first experience walking on the Great Wall. After some steep step sections, which give us a good inkling of what lies ahead, we walk predominantly downhill until we again reach Huangyaguan for the evening. Here the wall crosses the road that leads back to our accommodation. Night mountain hotel. Our day’s walk begins where we left the Wall yesterday, and we head up the steep renovated steps towards what appears to be a sheer cliff face. This is where we encounter ‘Heaven’s Ladder’, a steep climb of over 200 steps leading us up the cliff face. There are fabulous views from the top, and once we have caught our breath the path continues gradually on steep tracks through forest, up to the top of the ridge. Once again we join the old Wall, and follow it along the contours of the mountain until we clamber down into the valley below. We bed down in the houses of a local village, a real cultural experience. Night farmers’ houses. A quick 20-minute hop in the bus takes us to our start point just outside the village of Gubeiko. We walk through the village and farmland until our path takes us alongside an un-restored yet well-preserved section of the Wall. This part appears to be of almost brick-like construction and dates back to the Qing Dynasty – the last dynasty to rule over this vast land. We follow a track down into the valley in order to skirt a Chinese military post and follow dirt paths through trees and undergrowth before rejoining the Wall. There are some steep sections and we help each other out if need be. Stunning views of the Great Wall snaking along the hilltops keep us going whenever we find it tough! The final stretch to Jinshanlin is on restored Wall with lots of steps. A short walk through the village and small shops takes us to our simple accommodation. Night mountain hotel. Starting where we left off yesterday, we head up the carefully restored steps which take us into the mountains one final time. There are a few sections on older bricks and some dirt tracks, but for most of today we walk on good flagstones. The scenery is superb with rolling purple hills fading into the distance, dotted with many watchtowers; classic ‘scales on a dragon’s back’ scenery. After time to soak up this breathtaking panorama, we head down on small paths to meet our waiting transport which takes us to Old Badaling. Night mountain hotel. Our final day of trekking takes us up onto Shixiaguan (Stone Gorge) Wall, at Ancient Badaling. This is a recently restored stretch of the Great Wall that rewards us with wonderful views of our surroundings and is only occasionally visited by other trekkers, so it makes for a very unique and historic finale to our trek! Once we have absorbed the opportunities to take finish photos and enjoyed looking back over the mountains at our huge achievements, we transfer by bus to Beijing, the nation’s capital and home to over 20 million people! This evening we have a great celebration to mark our achievements. Night hotel. We enjoy time visiting Tianenman Square and the amazing Forbidden City, before free time to explore or shop. If you saw this on your arrival day, you are free to spend your time as you wish. Night hotel. Help us lead the fight against dementia. Spend six days trekking along the contours of the beautiful and remote sections of the Great Wall, China. Your opportunity to join a demanding but rewarding adventure to trek the historic great wall with people as passionate about mental health as you are. Take on an adventure across on of the seven wonders of the world for Girlguiding and help girls become the young women they want to be! Support vehicles and local guides, porters, cooks, drivers, etc. Accommodation on this trek ranges from good quality international-style hotels in Beijing to more basic mountain hotels or lodges. Expect plenty of variety. There is one night in guesthouses (dorm-style) in converted farmers’ homestays. Walking is partly on flagstones of various conditions on the Wall, and partly on paths through woodland or farmland. At times it is rough and rocky underfoot, at other times it can be muddy. There are also many steps. If you are unsteady on your feet you may find trekking poles useful. You will trek approximately 45km in total – though do not base your training on distances! It will feel far longer. It’s much more useful when training to think about the hours you need to walk for! Lying over 1000km from Beijing, Xi’an is the capital city of Shannxi Province in central China, and one of the most famous and ancient cities in China. It was the imperial city for 13 Chinese dynasties, lasting over 1000 years, and the starting point of the famed Silk Road. Its old city walls are some of the best-preserved in the country. During the Tang Dynasty (618-907AD), Xi’an was one of the greatest cities in the world with a population of over one million, and was a centre of international trade. The focus of this trip is the incredible Terracotta Warriors, at the tomb of Emperor Qin Shi Hung, 25km east of the city. Despite their world renown, the Terracotta Warriors were only discovered in 1974 when local farmers were digging a well. Buried for over 2000 years, the ranks of soldiers that can be seen today are one of the most amazing sights in China, yet were never intended to be seen by the public. Thousands of life-size terracotta figures of warriors, horses and chariots stand in battle formation, designed to follow their emperor into immortality. The figures have different facial expressions and marks of rank, and are incredibly lifelike. Originally they carried real weapons such as bows, swords and crossbows, many of which remain – and were still sharp when first uncovered. 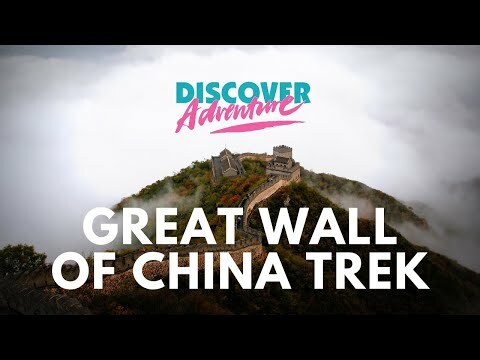 This is a great opportunity to extend your stay after your Great Wall trek and experience what is considered by many to be the eighth wonder of the world. The guides and DA leader were absolutely fantastic. Their support and professionalism were second to none. Had an amazing time trekking the Great Wall, was lucky to be grouped with a great bunch of people who all got on together. Matt, the DA guide, and James were both excellent in their support of us all. Very organised and professional but always friendly and supportive. Nothing was too much trouble, from giving a helping hand when needed to carrying much needed extra water and supplies, fantastic in every respect. Read more + thoroughly recommend it! We have had the most wonderful time. It has been a journey as well as an adventure. Read more + insight and memories to treasure forever. I have met amazing people, seem unbelievable sights that not many people will witness, seen the true wall not just the tourist parts, I have raised money for an excellent charity and have found the bug for adventures like this. I cannot recommend DA and this trek enough. You have to see it to believe it. Read more + DA highly enough.... where next??? Rated: 5* It was a really amazing experience; I overcame things I never thought I would and I saw some of the most magnificent scenery. Great team from DA as well! Rated: 5* Challenge far harder then expected but it pushed me to do more than I realised I could. Fantastic crew members who helped me every step of the way. Even at my worst moments they were very encouraging and gave me the confidence in carrying on. A good combination of physical challenge and amazing experience! It was a really amazing experience; I overcame things I never thought I would and I saw some of the most magnificent scenery. Great team from DA as well! Challenge far harder then expected but it pushed me to do more than I realised I could. Fantastic crew members who helped me every step of the way. Even at my worst moments they were very encouraging and gave me the confidence in carrying on. Read more + sunrise. Almost as special as the trek experience were the amazing people we got to know, each with their own life stories and reasons for raising money. We are well impressed with Discover Adventure and cannot recommend the company highly enough. Read more + future. We are even planning to meet up for another trek together! Well done Discover Adventure, I never expected that this experience would be so good. Watching sunrise to sunset. The three reps and the way they got on well and worked with each other. Everything. The trekking away from the tourist areas, out in the hills and the less used areas of the wall. Camp fires were fun and enabled us to form as a group and learn about each others lives and reasons for the challenge. An opportunity to see parts of China that are off the beaten track. An opportunity to challenge myself physically. Read more + accommodation etc.were very good and the trip leaders, Ade and Ben (and Phil, although I'm biased!) were fantastic, always encouraging and yet keeping everyone focussed. I wouldn't hesitate to recommend Discover Adventure treks to others. Read more + this for us. Read more + out of my comfort zone. We have made some very good friends and are planning a big group reunion hopefully in the new year. Most of all I would like to say what a fantastic bunch the leaders and the guides were. Ade went out of he's way to provide my husband with a cake on his birthday and was very supportive on the trek as was Ben and Phil. Lovely, lovely chaps! Alan and Dennis were great guides as you probably know but Dennis was a star. He cancelled he's night out and went out of his way to help us navigate the subway system in Beijing on a trip out to a show! I can honestly say it was an experience of a lifetime and I'm so very glad we found your company to do it with. We will be back! Outstanding organisation, brilliant leaders and a feeling of improved self esteem at completing the challenge. Read more + future.We are even planning to meet up for another trek together. Well done Discover Adventure, I never expected that this experience would be so good. I've made a lot of friends on this trip and we're already looking at what we can do next! Thanks DA for putting on a fantastic experience!